When my family talks about returning to Universal Orlando one of the first things that always comes up is heading back to Toothsome’s. 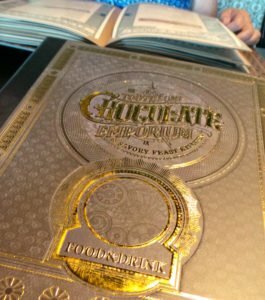 From the moment I set eyes on Toothsome Chocolate Emporium & Savory Feast Kitchen I just knew I had to eat there. 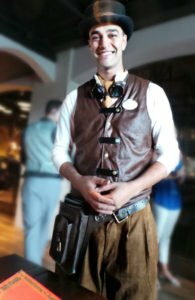 Before leaving for our trip to Orlando I had read online that there was a new steampunk + chocolate themed restaurant that was opening soon and had already put it on The List as a place I’d like to eat at during our visit. I’d heard that it was on “soft opening” (which apparently means open during limited hours, not taking reservations, and still “working the kinks out”). 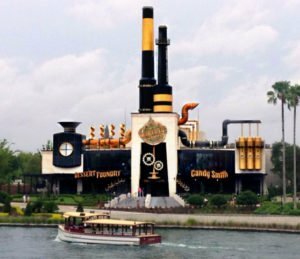 The first time I actually laid eyes on Toothsome Chocolate Emporium & Savory Feast Kitchen, the view from across the waterway of this whimsical factory, smoke stacks stretching high into the sky, it simply begged for exploration. (Later when we saw it again at dusk we noticed a cool detail, steam pumping out of the smokestacks). I had an easy time of convincing my family to walk over and check the place out. I tried to make reservations for the following evening, but they weren’t taking any. Everything was strictly first come first served because they were still in soft opening or preview mode. Still, we enjoyed the excuse to look around the space and that’s when we fell in love with the giftshop. The sweet shop portion of the restaurant was a delightful space, full of steampunk knickknacks, and handmade chocolates and sweets, fit to make Mr. Wonka fall into a jealous rage (we later received a surprise gift to our room of goodies from Toothsome and everything was scrumptious). We came back the next night, fully prepared for the idea that we might not be able to get in for dinner. We were delighted to find that not only did they have a table available for us, they had reserved some space for people from the Family Forward group and we were treated to a dinner by the Universal PR team (yes folks, it’s good to be a blogger). What followed was one of the most enjoyable dining experiences of my life. Even my very picky foodie husband thoroughly enjoyed himself. We started with the Chocolate Almond Bread with salted caramel butter. Served freshly baked and still warm this delicious bread, which wasn’t too sweet at all, was a hit with my entire family. Priced at $2.95 it’s a steal, you MUST order this. 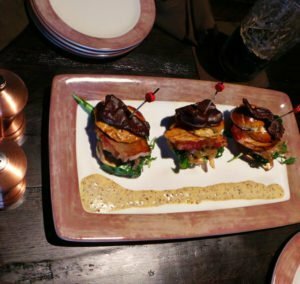 At the waiter’s recommendation, we went with the Pork Belly Sliders for an appetizer. Crisp pork belly with caramelized onions and a touch of mustard, served on a pretzel bun and topped with chocolate covered bacon (And yes, I would totally eat just a platter of chocolate covered bacon if they sold it. So much yum. ), we were ever so glad we listened to our waiter’s suggestion as these were ridiculously good. 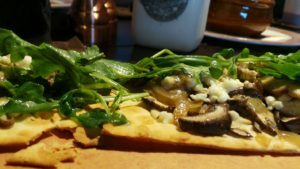 For dinner, I had the Forest Mushroom flatbread (mushrooms, goat cheese, caramelized onions, arugula, white truffle oil). It was delicious. My only complaint, and this isn’t a serious complaint, was that the portion was huge. I felt like it was meant to be shared, it was simply too much food (well with the Pork Belly Sliders and the Chocolate Bread, and darn it I was trying to save room for a milkshake!). 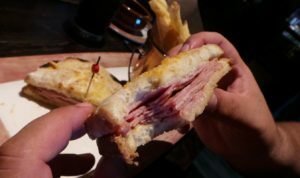 My husband had the Croque-Monsieur (ham and Gruyere cheese on toasted French loaf, grilled and topped with bechamel sauce) with a bowl of French Onion Soup on the side. He let me try a bite of each. The sandwich was tasty, and the French Onion Soup was absolutely O.M.G. fantastic (definitely adding it to the Must Get Next Time list). My mom had Chicken Bercy. 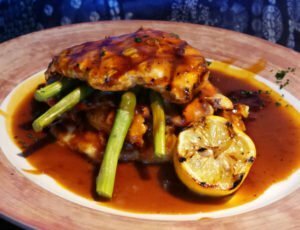 Again, it was a huge portion — two chicken breasts and a generous mound of mashed potatoes. My mom loved it but said it was too much food (How are we supposed to fit in those milkshakes?!). All three of us enjoyed our meals immensely. 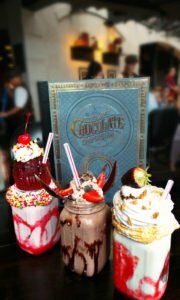 Basically, our only regret was the fact that we didn’t have room for dessert because the milkshakes and desserts we saw making their way to other people’s tables looked otherworldly. 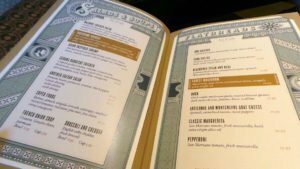 You can sneak a peek at their menu online over on the official Universal website. The kids’ menu had a decent variety of dishes on it (chicken fingers, mini burgers, garganelli pasta with marinara sauce, grilled chicken with jasmine rice, or waffle with bacon). The girls loved their dinner, said it was yummy and ate almost all of the generous portion provided. They both had garganelli pasta with marinara sauce (a.k.a. penne and red sauce), and to drink they had chocolate milk, of course! I even loved the glassware they served the adult drinks in (the kids’ drinks were in your typical plastic disposable cups with lids and straws). 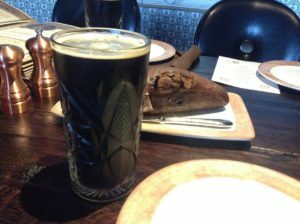 Our beer was served in these gorgeous vintage look cut glass pint glasses that fit the theme of the place perfectly. 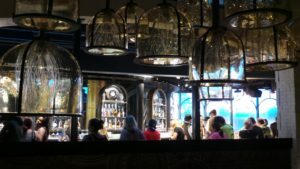 Toothsome Chocolate Emporium & Savory Feast Kitchen is named after it’s fictional proprietress, Professor Doctor Penelope Tibeaux-Tinker Toothsome. 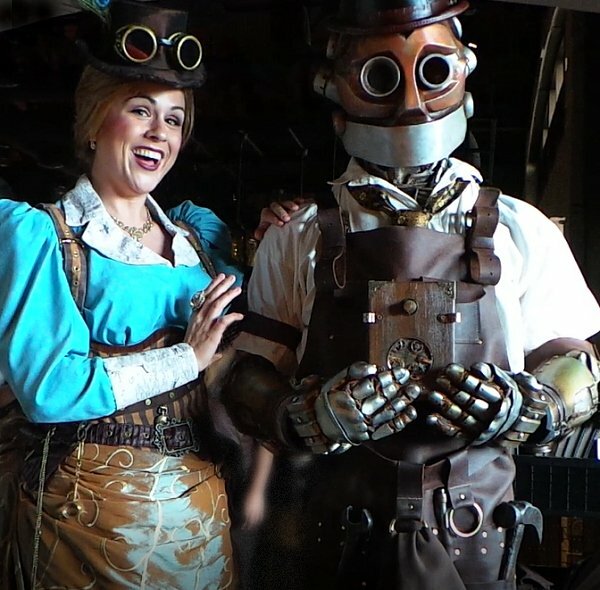 There’s even a little back story to the place, involving the chocolate obsessed Penelope Toothsome and her robot companion Jacques. 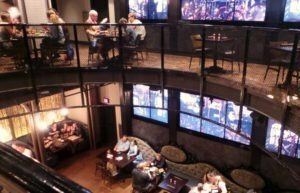 Everything about the restaurant is steampunk themed, and delightful from top to bottom. Everything had a wonderful quirky flair to it, Victorian details mixed with Steampunk fantasy. The waitstaff were dressed to fit the part, and they weren’t all in identical uniforms either. It was more like variations on a theme; all sepia tone clothing, browns and creams with a touch of mustard yellow here and there, leather belts and pouches, hats, scarves and aviator goggles. The restaurant walls were covered in period wallpaper, with vintage looking maps and photographs hung everywhere. 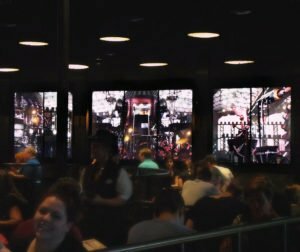 There were also screens built into the walls, with a looping image of gear works playing up the factory aspect and giving an illusion of depth to the place. The entire placed ticked and tocked. 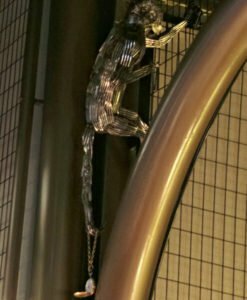 Every tiny detail fit the theme, from the sculptures hidden here and there, like this monkey made out of forks, to the Edison style light bulbs. Even the bathroom had a Steampunk look to it, with metal plates, rivets, and copper piping. Ms. Penelope Toothsome and her robot friend Jacques came to our table and chatted with us about their adventures. The costuming on these two characters was absolutely stunning and held up well to close scrutiny. This wasn’t like some character breakfast where you hurry to snap a photo of your kid with a Minion. This was a fun short chat where you got to interact with an actor in character. The kids got a kick out of it, and so, frankly, did the adults. Overall it was a fantastic dining experience. The food, the theming, both were perfect, a 10 out of 10. 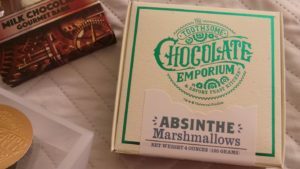 If you are visiting Universal Orlando I recommend the Toothsome Chocolate Emporium & Savory Feast Kitchen as absolutely not to be missed. Chocolate covered bacon? Sold. But seriously, the name of the place alone has me wanting to go. I know, right? . How can you not want to check out a Savory Feast Kitchen? WOW…sounds like an experience not to miss!! Wow – it definitely sounds other-world-like. And the food looks amazing! 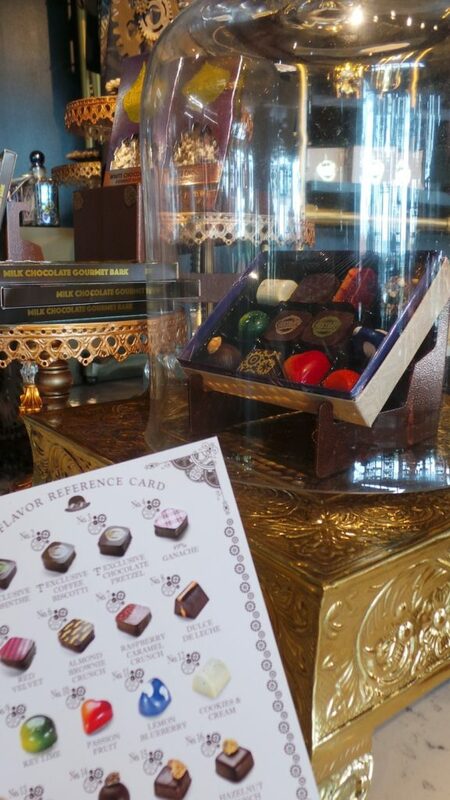 This place looks awesome especially the food and chocolate. 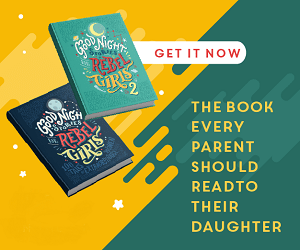 As I mentioned in the post we were treated to dinner that night, the Universal PR team picked up the tab, and I don’t recollect what our total bill was for the five of us at the end of that night. 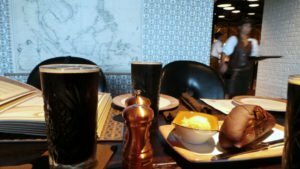 I can say that we went back to Universal Orlando a second time this past summer, and we ate at Toothsome’s on our own dime, once for breakfast/brunch, once for dinner. And we honestly considered squeezing in a third visit. Again, I can’t remember our exact totals, but I found the pricing on par for the other restaurants at Universal. I’ve seen other people online complaining that the chocolate bread that they serve isn’t brought to the table for free. But I think the $2.95 pricetag is reasonable, and it’s seriously scrumptious. I think the kids meals were $6.99, which seemed to be the standard for the sit down restaurants on site. Sneaking a peek at their online menu right now I can tell you that the all-day breakfast portion of the menu ranges from $7.95 for a plain waffle to $15.95 for a ham and mushroom crepe. The pasta and dinner entrees are in the $13 to $22 range, but there is also a filet mignon on there that will cost you over $40. 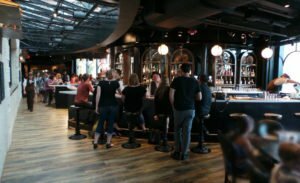 Toothsome was so new when I originally wrote this article that they didn’t have an online menu posted. I’ll have to go back and edit my post to add a link to the menu. Thanks for getting me to think of it.